Cherish Each Precious Day: Happy Birthday! 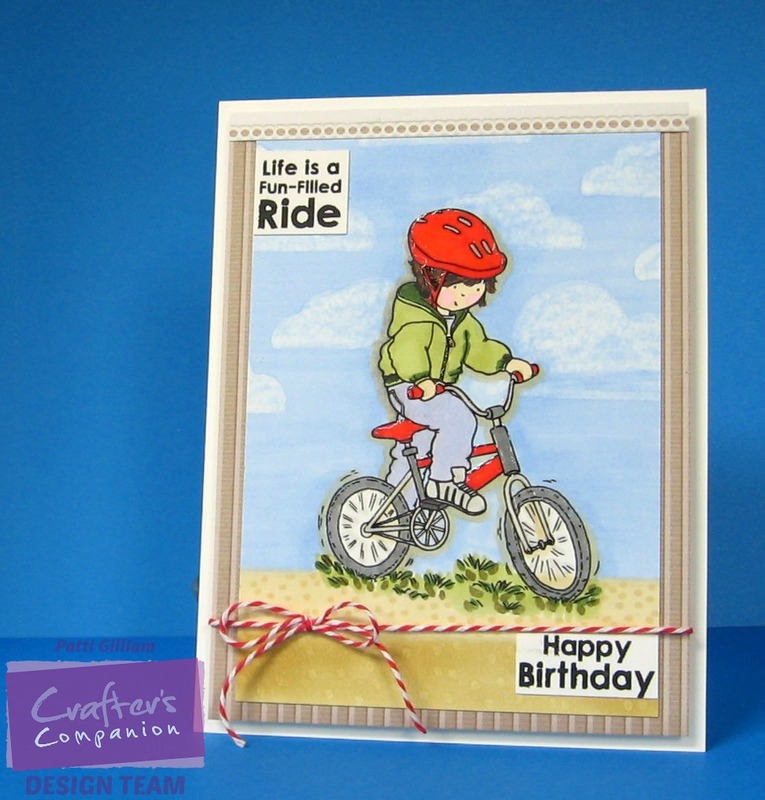 It's Friday, so I have a fun card that I created using Crafter's Companion products. I needed a cute birthday card and thought about this sweet Crafter's Companion stamp set. I really had fun with this card. I'm loving this Sara Davies paper pad! the card off with some Glossy Accents and Twine. Hope you like it! Hope you had a great week, and will get to relax a bit this weekend! Ohhhhhhhhh I love love love this!!!!!!!!!!!!!!! Love it and can't wait to see it IRL - to see the "motion" coloring. Darling image. Darling card Patti. Love the sweet image... great coloring. The background looks amazing. oh yeah! This is wonderful Patti! I love it! All the fun coloring details! Cool! This is so awesome and delightful and smile bringing - fun sentiment, wonderful background (you are quite the artist), and gorgeously colored image - all those elements come together to make this phenomenal card!!! Great card. I love how well it is coloured and the sky looks so real. A nice change from the sponged on skies I do. Have a great weekend! I love the little scene you created, Patti! Those clouds really do look realistic. Fabulous coloring! This card is simply gorgeous! Love the sweet image and all that you did to create the scene. Beautiful colouring! Thanks for sharing the idea of how to make clouds on a blue sky. Will have to try it!